A wonderfully tasty combination of ripe tomatoes, onions and spices. Goes great in burgers and steak sandwiches to name but a few. Tomatoes 45% (From Paste), Sugar, Water, Thickeners (Cornflour (from Wheat) Pectin), Food Acids (Acetic, Citric), Salt, Glucose Syrup, Colour (Caramel E150C) Tamarind Paste, Yeast Extract, Clove, Nutmeg, Onion 0.5%, Pepper. 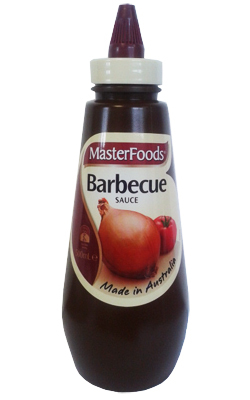 100 x better than any other BBQ sauce!